Ask the average commuter how many peaks exist in a week on London transport and, after a bit of thought, they’ll probably tell you ten – five morning inbound and five afternoon return. In truth though there are more. The Sunday evening rebound via London main line termini and airports, after a weekend or week away takes us to eleven but there is also another. For many of the capital’s workers stay behind, have a drink, have a meal, or go out. Add evening-only visitors and, particularly on Friday and Saturday night, another peak appears. The Night Tube, now arriving at a West End platform (and along selected lines) near you, is a response to this. It’s been a bit delayed from hopes of delivery in 2015, but it is time to take a look at where it came from, what’s now being delivered and what more might be possible. As most denizens of London’s night will know, Night Tube is not the first means of nocturnal transport in the city. The precursor in strategic change was the reform of the Night Bus network, over 32 years ago. This was introduced in April 1984 during the narrow window of policy opportunity between the election of Ken Livingstone’s GLC in May 1981, the eventual successful introduction of reformed fare structures on 22nd May 1983, and the Government’s enforced dissolution of GLC’s control of London Transport on 29th June 1984. 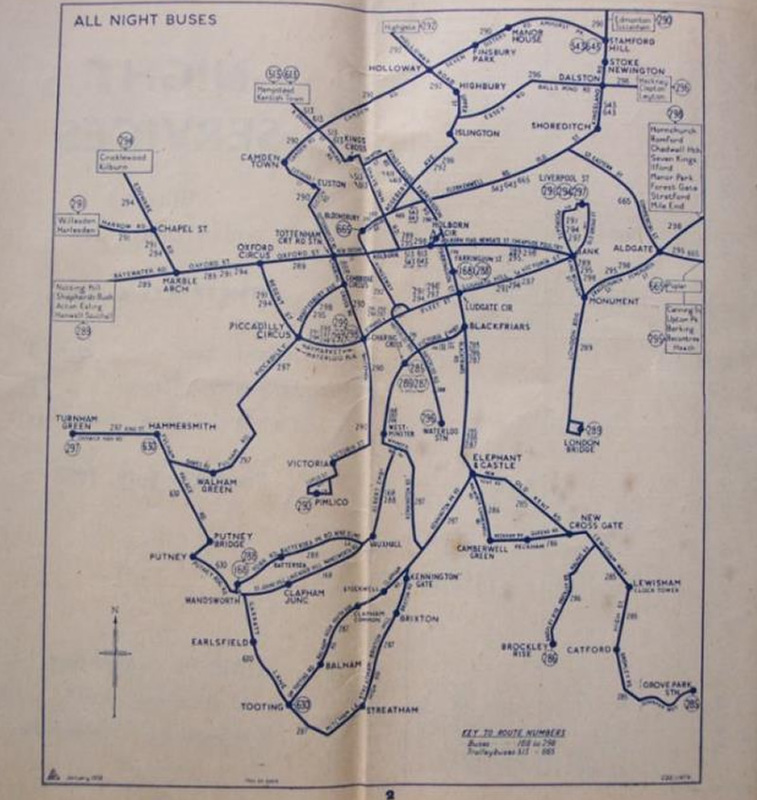 Previously the Night Bus schedules (and those of Night Trolleybuses and Trams) had been aimed at essential night workers, such as workers in Fleet Street and the Docks, and office cleaners, not revellers. Hardly any buses ran on Saturday night before the dramatic change. There were limited alterations beforehand, including extending the N97 to Heathrow Airport as a major location for 24-hour employment outside central London, on 28th January 1978. That was also the first time a service ran with a 30min frequency at night. At that time, LT was also still running (on contract) the London – Heathrow direct bus service with Routemasters and luggage trailers, which included night operation. The combination of the ‘daytime’ Piccadilly Line extension from 1977 and the N97 from 1978, however, led to the end of that service in March 1979. In launching a revised network, it was relevant that 1983 had been the first year in many when London’s bus services were free of the twin constraints of staff shortage and a lack of serviceable buses – which the 1983 LT Annual Report celebrated after several decades of reporting struggling performances. Previously there had seemed little point trying to expand service delivery throughout London when the basic ‘daytime’ network was still deficient. A review of night bus operations was undertaken in 1983 by the Oxford University Transport Studies Unit, sponsored by LT and with GLC support and the transformation from April 1984 was – quite literally – an overnight success. It was presaged by increasing operational frequency of the previous Night Bus network during 1983, including running those established routes on Saturday nights. 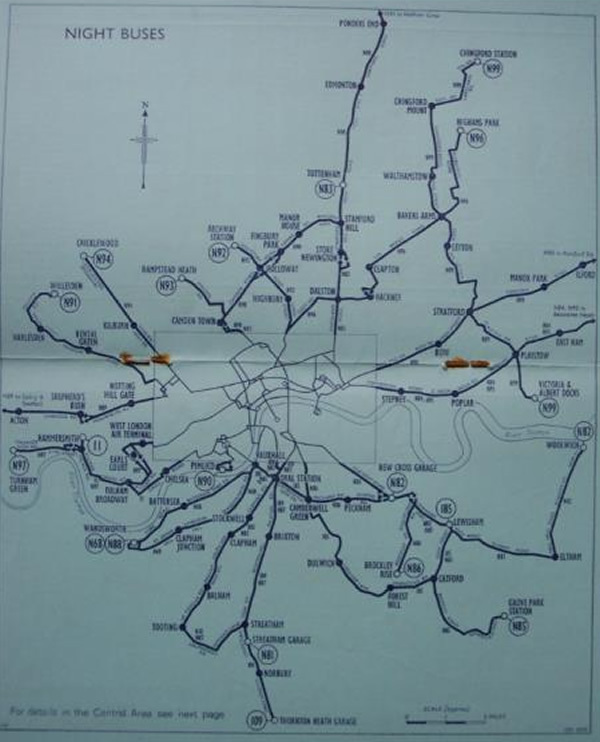 The reshaped 1984 network with greater suburban coverage and emphasis on seven nights a week operation caused huge passenger volumes to converge on Trafalgar Square and Aldwych (the new overnight local transport hubs), and at other major interchanges. The network has continued to grow, and London now has a high frequency and high-density bus network at night, reaching into many outer suburbs and along orbital corridors. A variety of London routes now run 24/7 alongside the other night-only routes. There are currently few built up areas within Zone 5 without a Night Bus service within a mile, which makes its own point about the scale of demand. It also points to the underlying potential for night Tube and train operations. A small scan of the 2014 network is shown below to provide context for the current scale of operations. 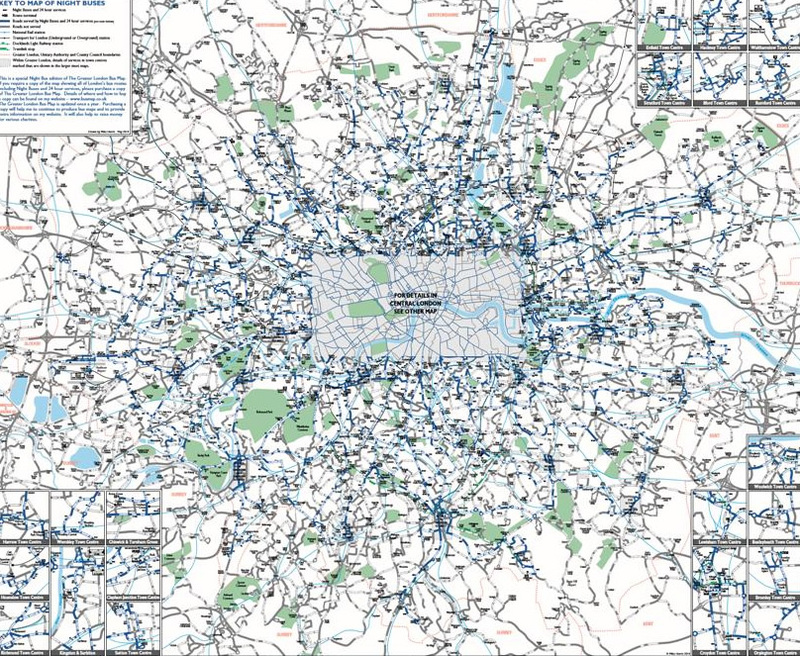 Readers are directed to Mike Harris’s website if they wish to acquire his maps of Night Buses, or of London’s surface public transport more generally. 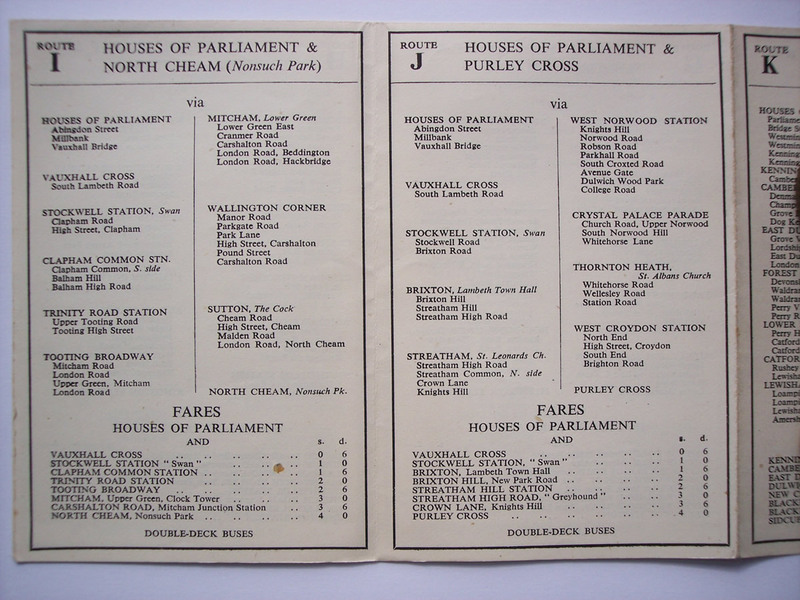 Featuring Routes A-K – which went to such diverse places as Becontree, Enfield, Highgate, Queensbury, Harrow-on-the-Hill, Sudbury, Isleworth, Kingston, North Cheam, Purley and Sidcup – these were introduced for MPs, Lords and parliamentary staff during the marathon sessions of the first Attlee Government. 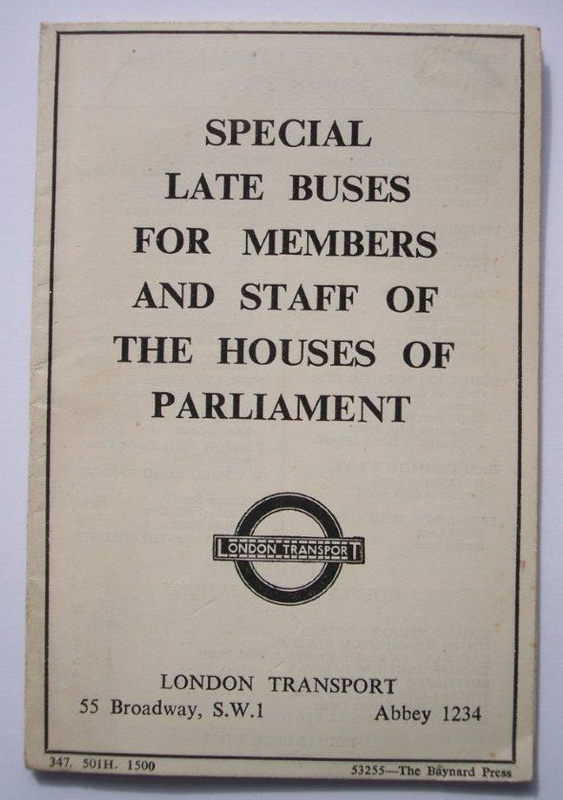 They were also used as a marketing exercise by the London Passenger Transport Board, with a lot of information about London Transport in the service leaflet that it was perhaps hoped bored MPs would read on the bus home. Conventional Night Buses and Night Trams aren’t mentioned, though Embankment night trams would have served Westminster as usual, plus the 290 night bus passing Parliament Square on its way between Pimlico and Edmonton. Returning to the modern day, the case for overnight Tube operations, previously unthinkable, has now come to the fore. It is partly stimulated by the Night Bus network, itself becoming saturated with demand on major London corridors. It is also a result of changing lifestyles which require a more 24/7 London. This isn’t to say that Tube and bus haven’t overlapped before – some Night Bus routes were marketed as providing overnight cover for parts of the Tube network from the late 1980s onwards. The N1 ‘Northern Line‘ bus to Barnet being one example. Night Tube has been created not only to match this growing travel demand for more (and later) trains, but also to take the stress out of London’s currently over-subscribed last Tubes – particularly on Friday and Saturday nights. It is also likely to bring more people into popular night-time locations later than people now turn up, and create more of a fully 24-hour leisure and hospitality metropolis. This growing nocturnal city isn’t just a popular myth or aspiration. 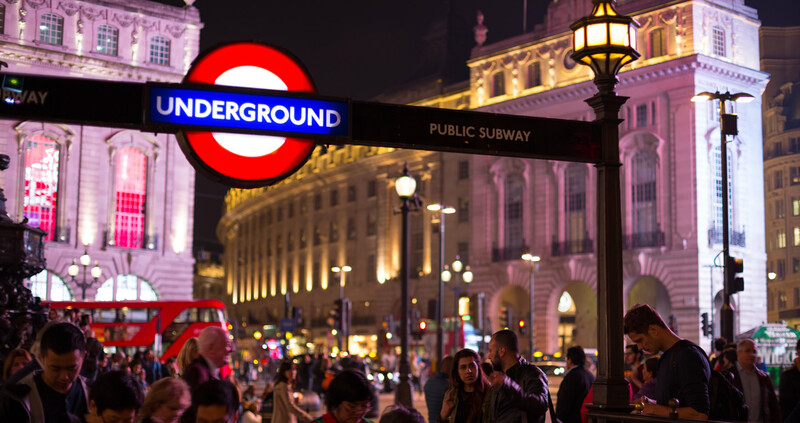 Changes in the usage of different types of Tube stations during weekday evenings and at weekends have provided ample evidence as to the growing London overnight economy for some time. Demand in the high-density inner suburbs may mean these areas take the greatest advantage of the new travel facility (perhaps linked to population revival and lifestyle changes). 62% of the busiest 2012 stations exited (over 2,000 passengers exiting after 10pm, based on weekday volumes) are in Zones 2 and 3. As with the Night Buses, the ability to transform tube operations into overnight services has relied on the Tube itself being highly robust and competent at its ‘daytime’ job. It is not an overstatement to suggest that the huge logistical preparations for, and great operational success of, the Underground during the 2012 London Olympics, when there were some extended operational hours, gave TfL confidence that more could now be asked from the Tube. The Tube ran approximately one hour later every night during the Olympics and Paralympics, except for during the Olympics Opening ceremony where two hours extra service were provided. The lines serving the Olympic Park (Central, District, Jubilee, Hammersmith and City) operated a ‘third peak’ between approximately 23:30 and 00:30. It wasn’t quite a full peak service but accommodated the longer dwells for loading at Stratford and West Ham. TfL gave thought post-Olympics to which lines would be most suited to Night Tube operations. The business case was developed by TfL from existing demand for Night Bus travel, based on analysis of over 100,000 Oyster tap-ins on Night Buses. While the market demand highlighted the deep tube lines through the West End as the obvious priority, there was also a case for some of the sub-surface lines: the initial feasible network included District line services between Wimbledon and Edgware Road, Wimbledon and Barking, and the Hammersmith & City line. 1) Services where there is an existing demand for overnight transport. 2) Minimum 6 trains per hour (tph) per direction through central London. 3) Each line to pass at least one train maintenance depot. 4) Minimal impact on major upgrades, where the SSR upgrade and Bank capacity works are negative factors. The importance of the existing demand for overnight transport was recognised. This has meant defining an Underground night network which reflects, so far as is possible, the busy night bus routes. The Night Bus network has evolved to have some termini at Tube stations, for example Stanmore (bus N98), Edgware (bus N5, N16, N113), High Barnet (N20), Cockfosters (N91), Morden (N155), Heathrow (N9). The N8 passes Hainault station to terminate just beyond in a suburb of Hainault. The single busiest part of the night bus network is Leicester Square to Camden, where route N29 operates 18 buses-per-hour (bph) all night. This led to the decision to operate all Northern line trains via the Charing Cross branch (at 8tph, a higher frequency than the minimum 6tph), with 4tph onwards to each of High Barnet and Edgware. Practical operating reality is that there will inevitably be some unplanned stock swaps, just as there are now. Therefore each line needed to pass at least one maintenance depot. On the Central, this led to the decision to go to Hainault at the east end, as well as via Woodford which is the busier corridor (White City is just a stabling facility and not a good place to put a defective train). Parts of the Underground are in the midst of major upgrade works. Line modernisation with the Sub-Surface Railway (SSR) resignalling programme (Four Lines Modernisation or 4LM) and related works meant there was good reason not to infringe on the engineering closures, at least until those works were complete. This is now further into the 2020s than previously foreseen. So the biggest impact of these works is that the Night Tube is not initially operating any of the Sub-Surface Lines. There remains a good case for operating much of the District line (e.g. Ealing/Wimbledon to Barking) as a Night Tube. The forthcoming Bank station capacity works also influenced the decision to not operate the Northern on the Bank branch. The New Tube for London project was some way down the timeline, and any Night Tube engineering complexities with that will have to be addressed as those schemes come forward. Oyster Zone stations are colour coded (eg, Green for Zone 3). Catchments shown as 800m. Density of Zone 1 stations means these are not highlighted. The Bakerloo exclusion could be questioned, as the line primarily serves inner north-west London and thus might be a good source of high density inner suburban travel. It also serves Trafalgar Square, one of the busiest Night Bus hubs in central London. TfL’s analysis of Night Bus demand in the corridor, however, showed there simply wasn’t enough travel volume in the catchment. Meanwhile, the Jubilee is quite close for the section through central London, and it isn’t so far either at some of its north-western end. Part of the Bakerloo’s problem, too, is that it doesn’t really go anywhere on the south side of the river, so lacks a two-way flow through central London. A further secondary consideration is Network Rail’s infrastructure, with a depot located on that part of the railway. The current requirement for the line’s trains to be given a life extension – see our previous article on there being no do nothing option for Bakerloo trains – was not actually a material factor in the Night Tube exclusion. The reconstruction work at Bank station, at least until 2021, is an important factor for not running the Northern Line Bank Branch now. Also demand looks to be much higher on the Charing Cross branch in any case, so initial operation has been focused on the West End. 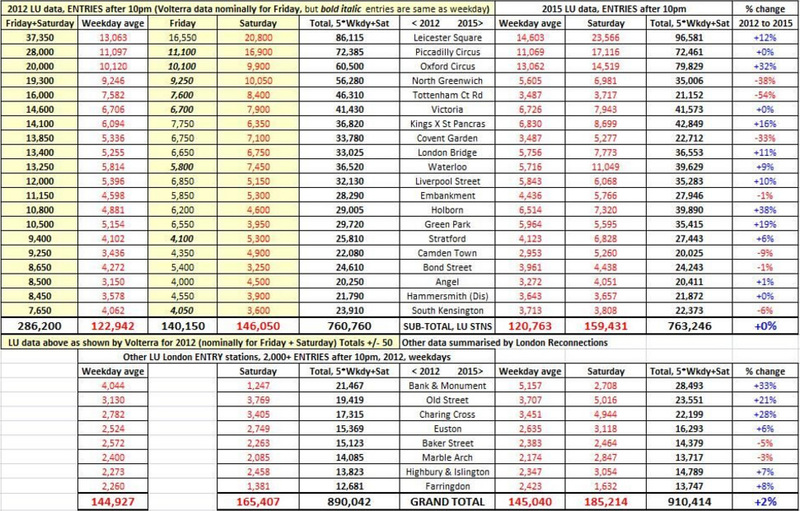 The evidence of three Northern Line Bank Branch stations (Angel, Old Street and Elephant & Castle) being in the busiest stations’ lists for 2015, and with Kings Cross St Pancras and London Bridge on the route as well, might point to a demand case for eventual Night Tube operation. Moorgate/Liverpool Street as a unified station might also count in favour of the Bank Branch night opening once the Elizabeth line (Crossrail) opens, which itself is another night-time operations target. More generally, a longer term Night Tube demand case might also look to Night National Rail operations, something we’ll investigate in Part 2. From 2015, Londoners and visitors to the capital will be able to take the Tube home at any hour of the night on Fridays and Saturdays, supporting London’s vibrant night-time economy and boosting businesses, jobs and leisure opportunities. The new ‘Night Tube’ network has been made possible because significant parts of the LU network have been successfully modernised. From 2015, weekend services will run through the night on core parts of the system – initially comprised of the Piccadilly, Victoria, Central and Jubilee lines and key sections of the Northern line. This network, which will be expanded to include other lines in subsequent years, will dovetail with existing 24-hour and Night Bus services to give passengers an extensive and integrated service throughout the night. This led to major discussions throughout London. They included not just the trade unions, with union and staff discussions and extensive training which was taken in hand, but also political, community and other stakeholder groups, and key business groups and targeted industry sectors. Bespoke meetings with transport lead councillors and officers. This had to work in practical terms at individual borough and station level, as TfL intended that all stations on each open part of line would be available for public use. To supplement the business case, TfL and London First (the latter being focused on improving the London economy) commissioned a detailed review in early 2014, this time from Volterra Partners. Volterra reported in September 2014 (see the executive summary and full report), having researched the benefits to the night-time economy. Volterra restated the summary highlights from the TfL business case in their report, including TfL’s analysis from a year before about the historic travel trends and some data to 2012. 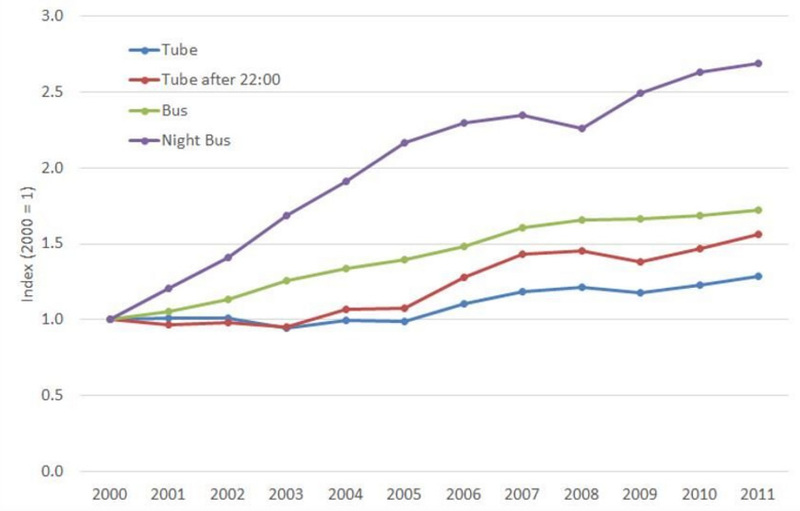 Comparing ‘day’ and ‘night’ buses, and ‘day’ and ‘after 10pm’ Tubes, the late evening and night travel demands were growing faster than ‘daytime’. The demand for the Underground on Friday and Saturday late evenings was well above average, as shown in the table below. Looking at individual stations, the ‘Top 20’ for entries and for exits were listed for actual rather than projected 2012 volumes. As well as the predictable Friday and Saturday entry locations in the West End and neighbouring areas, and the South Bank, there were some significant suburban entry stations: North Greenwich (O2), Stratford, Camden Town and Hammersmith. There is clearly some impact on volume when stations are partially closed for major works, such as during 2015 at London Bridge and Tottenham Court Road. However travel would often divert to other stations, so the bigger headline is that there has been only small growth in late travel demand in the 2012-15 period at existing busy stations. There is even some evidence in the original data of a softening in demand, when comparing 2015 with 2014. So the arrival of Night Tube could be an important stimulus for a stronger London night time economy. There was substantial modelling by Volterra of narrow and wider economic benefits. Readers are encouraged to search the main report for full explanations of the analyses undertaken. The summary headlines are below. This might not seem a large jobs gain, but over a year there can be millions more contented customers at night-time venues as well as on the Tube, and hundreds of millions in additional spending. So the truism applies – transport is a means to an end, not an end in itself. Overall demand projections for the Night Tube suggest that usage between the hours of midnight and six am will make up approximately 5% of total London Underground usage on Saturdays and Sundays. This can be benchmarked against equivalent usage of the New York Metro during the night to give a reference point. Over 7% of total Saturday and Sunday usage of the New York Metro is between the hours of midnight and six am, which suggests that the demand estimates for the London Night Tube may be conservative. 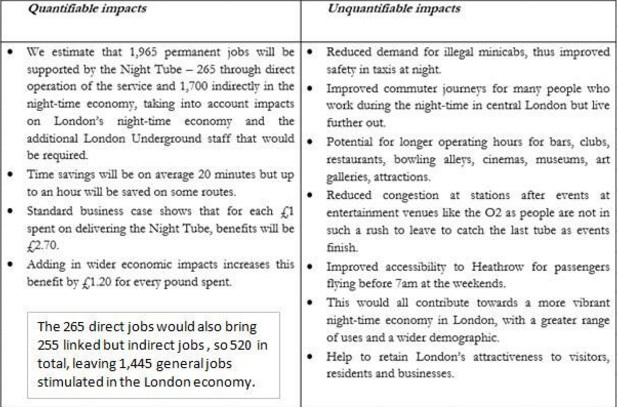 The data presented above provides a basis upon which to estimate the economic impacts of the Night Tube, as summarised in the main report. It should be noted, however, that the impacts may go beyond this. For instance, it is effectively assumed that trips are only affected from midnight onwards, whereas in reality there may be a larger impact than this. As well as people staying out later in a particular area and therefore making a later return journey than they otherwise would have done, a higher number of people may travel to a particular area earlier in the evening, and therefore the pattern of trips before midnight could be affected. This has not currently been addressed in the analysis. Volterra ran sensitivity tests for Sub-Surface Line operations on Fridays and Saturdays, and for the five core tubes running also on Thursday night. The Sub-Surface Line chosen were: (Metropolitan) Aldgate to Harrow-on-the-Hill, (Hammersmith & City) Tower Hill to Hammersmith, and (District) Barking to Wimbledon. Extending the Night Tube service to further lines would increase the level of job creation by around 5% relative to the base case, whereas extending the Night Tube to Thursday nights would increase the net additional jobs by almost 20%. As shown above, many outputs and outcomes arising with Night Tube will be quantifiable directly, such as the potential for a longer period of over-night leisure activities for large numbers of people, greater night-time employment, and in volume of extra tube travel (plus changes in Night Bus service patterns and demand). Other outputs may harder to define but nonetheless significant – wider economic values, impact on some suburban as well as central London evening and night hot-spots, and quality of travel for essential overnight/late evening/early morning workers (at least for two nights a week).Then there are the intangibles, which will still matter: such as changes in lifestyle patterns, London’s world city ranking, and whether the ‘must catch the last Tube’ syndrome fades from memory. Above all, the question is: will London ‘embrace’ the Night Tube? It’s necessary to pinch oneself a bit – this is not a New York-style 24/7 operation relying on an extensive four-tracked network, where trains switch onto parallel tracks from lines and signals under repair and maintenance. Partial single track operation, Eurotunnel style, would be a massive billion pound engineering challenge logistically and financially to retrofit into parts of London’s Underground network. It would also be virtually impossible operationally for multiple reasons, particularly where demand was greatest and pointed to high frequencies. So overnight operation on London’s twin-tunnel single track network is, at this stage, only for Friday and Saturday nights, and reliant on successful engineering outputs on the other five nights a week. The Night Tube project could be considered to have gone live in November 2014, in terms of policy endorsement, benefits to London as defined by Volterra, and definite commitment to delivery. It achieved full delivery focus from 16th July 2015 when a specific report was submitted to the TfL Rail & Underground Panel at its meeting that day about project progress to date, and final steps to implementation. It covered some of the recent history as described above, following the ‘Tube future vision’ of November 2013. The main report was endorsed. Basically it was up to TfL to get on with it, from that point onwards. The prevailing branding, mainly used for internal audiences, was shown (see below) as a Tube train in tunnel with strong headlights illuminating the future train path. The Night Owl logo was also present in some draft material, as well as early use of ‘Free the Night’ slogans and graphics. It was then planned to launch a complete five lines Night Tube service, simultaneously, on 12th September 2015. However there was a delay, arising particularly from an industrial relations dispute. This took time to discuss and work through at staff representatives’ level as well as with national trade unions. The final stage to introduction, initial results and the potential for broadening of Night service operations, will be discussed in Part 2. The author wishes to acknowledge Walthamstow Writer for his help with Night Bus information on the N97 data. For more on the rollout of the Night Tube, listen to our podcast episode with Kevin Dunning, the Director of Asset and Operational Support for London Underground. Correction – don’t you mean “32 years ago” in the third paragraph? A very interesting article! There is no reference to the Uxbridge branch of the Picadilly Line. I assume this was omitted from the night tube due to a lack of demand? Still, I’m surprised that night tubes have not been realigned to run from Acton Town to serve the line. One factor I’ve not seen mentioned in any Night Tube articles (here or elsewhere) is the effect on people living near to the lines in question who now have trains rumbling past all through the night rather than stopping between around 1am-5am as per the midweek service. Has there been work done in preparation to reduce the impact on people adjacent to the lines in question? And that is going to be the real test of this working as a proper service. Will the maintance be possible, not this year, or even next, but in subsequent times, with all the usual pressures applying? I like the idea of “officer cleaners” early in the piece. One aspect of the ‘not having to run for the last tube’ which doesn’t seem to appear in the tables is that there will be people who *because they couldn’t get home* didn’t go out in the first place, either at all or via public transport. This could mean either a reduction in private car usage (and an increase in permitted alcohol consumption) or new journeys entirely. “The precursor in strategic was ” – I think there’s a word missing here. Perhaps “terms”? I am genuinely surprised that TfL went off to do work on the Night Tube after 2012. I have long felt this was a purely political construct given it was used as a classic “shiny bauble” to deflect people away from the simultaenous policy of shutting ticket offices and “adjusting” station staffing levels. I know we are going into the IR woes in Part 2 but the fall out with the unions also supported my belief that there hadn’t been much “planning” involved before the announcement. I’m obviously not the target market segment for the Night Tube but I still really struggle with the idea that there is any sort of business case for this operation. Yes Night Buses are busy, some horrendously so, but buses are a flexible mode where capacity can be added / taken away with relative ease. Deciding to go for a policy that will be impossible to reverse or cut is a very brave move when there are a load of factors that could go wrong at any time – the biggest being the economy. One of the telling factors of an economic downturn is that discretionary spending on arts, eating out, night clubs etc declines sharply. This leads to job cuts and business closures in the “leisure” part of the economy and, of course, other jobs go too. This means the base level of demand for the Night Tube (and Night Buses) could shrink quickly and substantially. What will TfL do if we have a downturn? Massacre the night bus network to retain the night tube or would it be brave enough to cut or shut parts of the Night Tube operation? Isn’t it also the case that the payback period on the Night Tube is a long way off although I am mildly amazed to see Volterra say it will be financially positive. The main element of the case is time savings but I wonder how much time really will be saved if you have a wait for a bus once you get off the tube – especially if it is the Night Bus you could have caught in town anyway. 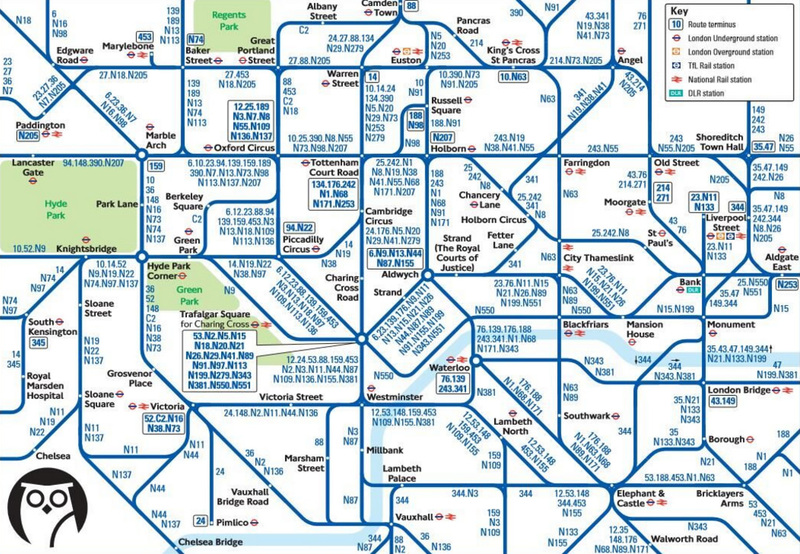 Not everyone likes the idea of a long walk from a tube station in the middle of the night – I think the catchment area map seems to assume twice the access distance at night compared to the daytime. I am also waiting to see what LU decides to do when it eventually gets round to upgrading the Piccadilly Line. There is so much work needed that I simply don’t believe it can do without the benefit of 52 hour weekend blockades. Are we then going to have “replacement Night Tube buses”? While upgraded lines can survive for a period of time without intrusive / more involved maintenance there comes a point when they will require more substantive work. Some of the Vic Line track was sounding distinctly “off” last time I used the line and while you can hand grind on a short term basis the line will need the use of a rail grinder at some point. I don’t think you can run that effectively in standard weeknight engineering hours. I wait to see what the reaction is to the first weekend of Night Tube engineering hours and whether the media decides to stoke up a load of faux hysteria (as they now do whenever seasonal engineering works are announced for the tube and National Rail networks). @ Moogal – I dare say we will get some detail in Part 2 but I believe it has been the case that there has been a lot of noise monitoring and also works to alleviate the worst aspects of rail noise / squealing / rough riding etc. I suspect part of the reason for the phased introduction of the Night Tube has been to give time for engineers to do targeted maintenance to deal with the identified noise issues. I’d be interested to know if there has been a noticeable decline in Zone 1 road traffic since the introduction, especially given the rate that private hire licences have been dished out. How long before accurate findings can be established? What has the impact been on hackneys, addisons, ubers and the rest in central London? And has drink/drug driving declined? Have the police noticed a drop in crime and fights when everyone used to get turfed out from drinking establishments at the same time? How are TfLstaff finding it, both station staff and the new drivers? Any comment so far from the BTP? Perhaps we’ll get some further insight after Xmas or next summer? (p.s. the trick is to stand on nightbuses… never, ever sit down to rest the eyelids!). It is also bit of guaranteed growth in case some of the other modelling as a bit over optimistic! I can see NTfL works leading to partial (due to turn back facilities) night tube withdrawal on lines for resignalling and other upgrades when the time comes but potential Crossrail and SSR night running should offset this to a reasonable extent for the Piccadilly and Central line works. If the midweek service finished by 11pm (as many national rail lines do), then introducing a night service would make a significant difference to many people, but I’m not sure that going from a 1am stop to all night will do. Surely the vast majority of people are in bed well before then on most nights anyway? If noise from the midweek service isn’t a problem for them, it’s unlikely that noise from the night tube will be. The real advantage of the Night tube is at the other end …. Early ( i.e before 06.00hrs) in the morning. The first-tubes are uniformly wedged & the night buses crammed & desperately slow. I’ve caught the first train off Walthamsow Cent, often enough, to realise that, at least on Saturday/Sunday AM, one will not have to desperately try for that first train – on can get up earlier & take your time …. WW – the geographical catchment areas are standardised at 800m from station entrances. This is TfL’s 960m PTAL station access standard (12 minutes at 80m/minute walking, or 1000m at about 83m/min) reduced by a factor to allow for the fact that rarely do you get a direct walking route to/from stations from all directions of the compass. So actually this shows a minimal walking distance. I remember walking a mile or two to get home late evening from a tube station when buses weren’t to be trusted. Mark – Night National Rail services are to be covered in Part 2. There are some interesting points to consider there. Separate comment on your valid concerns about what happens if/when there is another economic downturn and discretionary spending including leisure gets canned. 2007-10, but travel volumes generally held up and even grew to an extent, overall. There will be various reasons, but growing baseload population numbers and the arrival of Oyster/PAYG helped greatly. Looking ahead, and not forgetting Brexit (a current big risk factor? ), population is still expected to grow in all economic circumstances (see NR’s 2043 LSE market forecasts), while the Night Tube could potentially be a counter-factor to bolster demand in central London, against otherwise credible fears of lower spending on leisure. Where lower demand might then occur, is in the suburbs…? Worth a thought, catastrophe theory doesn’t predicate that the way back up is the same path as the initial collapse! All over? Not many from Bexley, Bromley, Croydon, Sutton, Kingston or Richmond, I would guess. It has been my impression that Thursday evening has become the ‘new Friday’ for central London workers who commute by rail- ie Thursday seems to be a popular day for after-work socialising. 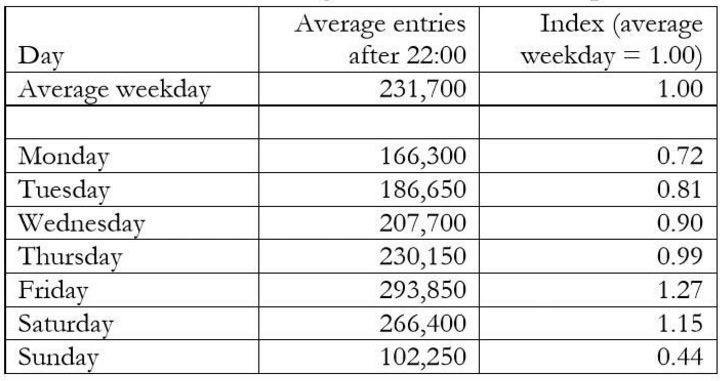 The table of Tube entries after 22.00 backs up that observation (sort of) in that Thursday is the next busiest evening after Friday and Saturday. Possibly extending Night Tube to Thursdays is a step too far in terms of reducing maintenance hours. It could be that the Night Tube will see a drop-off in Thursday evening use as Friday is more attractive from a public-transport viewpoint. We will see. – Comments from BTP that crime levels are very low and lower than previously experienced. – places like Stratford are very busy as are connecting night buses. – the weekend night buses at North Greenwich saw a big leap in usage once the Night Tube started. – no massively full trains either. Fairly busy from 0100-0230 then a pretty quiet period and then a pick up for those needing to get in to town early for work or other connections. – I’ve seen nothing about night bus loadings nor the impact on taxis/private hire/Uber volumes. I expect TfL are holding off until all lines have launched and all the extra weekend night buses are operational. We then have to get through the festive period which will skew numbers. We then have a decision point sometime in early 2017 about whether TfL implement the planned reductions to night bus services that were postponed by the new administration at City Hall. @ Timbeau – given there are constituency and Londonwide members I don’t think geography is any constraint on AMs and their questions! @ JR – thanks the PTAL distance clarification. I agree with you that 2007-9 was unusual in that there was not a massive dip in patronage on rail. Night buses did see a dip – especially on routes to West London. I am less confident that the factors that helped bouyancy would do the same next time. I am also distinctly sceptical about wider economic factors and population growth assumptions remaining broadly unchanged. This then undermines things like NR’s 2043 forecasts. I only hope NR and TfL have been doing some sensitivity analysis for London and SE forecasts. In the short term then we have a fair amount of infrastructure in build which will pull in patronage but I think it all gets a lot harder after that – both for day to day traffic volumes and future investment. I may well be proved wrong and hopefully I will be. Delighted to see this article which covers something which just has not be properly covered at all by anyone and certainly the historical aspect is largely ignored. There must have been a lot of research involved. My one puzzle is your comment about why there is no service on the Bakerloo line. I was sitting next to you at a talk where the principal TfL Rail planner, Geoff Hobbs, stated quite categorically that they would love to run a service on the Bakerloo line but the state of the line [I presume that included trains] meant that it just was not practical as they needed to have engineering hours available throughout the week just to be sure of keeping the line running. Will you also be looking at the changes to physical security at stations? Quite interesting to see all of the additional barriers etc that have gone up to control Night Tube traffic. Some of the access routes also seem a little confusing – e.g. Euston, where once the main concourse is closed, access to the station is by a staircase / pair of elevators that are practically hidden. Anecdotally I have heard that Uber demand in central London has collapsed markedly – people are using the night tube to get to the ‘closest’ station to home and then using an Uber for the ‘final mile’ instead. Will probably take a while though for this to reflect in congestion levels in the centre, as drivers re-adjust to the ‘new normal’. It is not possible to include the Uxbridge branch of the Piccadilly line because this is shared with the Metropolitan line which due for resignalling under Four Lines Modernisation. This will need all the engineering hours they can get. In any case they don’t want to dilute the service to Heathrow. You need to be in the West End on a Friday or Saturday night to understand that the demand is there and it could well pay its way – depending on how you allocate costs but if only the minimum marginal costs were applied I see it as quite plausible. Of course it is possible you could get a downturn but I suspect that is quite unlikely with a population increase and one of the expected side effects of Brexit being more tourists in London as they are attracted by the better exchange rate. One could argue against loads of things by suggesting their could be a downturn but all the evidence of recent years suggest that in London it is minimal or non-existent whereas increasing demand is regularly seen. Totally agree about Thursday being the new Friday. I would suggest that on Thursday night revellers tend to go home much earlier than on Friday/Saturday and what is desirable from that point of view is for an extra couple of hours service on Thursday night. How practical it is to lose yet another night for engineering work is another matter. On Thursdays, Fridays and Saturdays the very late tube service is generally inadequate – especially for people going for their last National Rail trains. My big disappointment is that the opportunity has not been taken to increase the service around midnight on Night Tube nights and start thinning out the service around an hour later. Small typo in the italicised footnote, tour should be to our. @ PoP – I may not be a frequent late night visitor to the West End and City and Camden and Shoreditch but I have visited every year for the last few years in the Summer so have some awareness of what goes on. I have also done the Night Bus slog into town and back out again on various different routes so have some appreciation of loadings and where people are travelling. I make no claims that that is a scientific or robust view but I am not wholly ignorant. I fear we must agree to disagree about the economy and London’s economic robustness. I think the housing cost issue is the massive ticking time bomb under London’s economy. There is no obvious progress from anyone on this front. In fact you could argue a number of policies are designed to throw an awful lot of fuel on a “fire” that is already burning out of control. When people simply can’t afford to live here we will see all the economic consequences that follow – businesses will leave / relocate / close. There are already reports that this is happening. Essential services will crumble and that includes night buses and tubes. Bus operators are already in dire trouble with recruitment and retention and if rents keep rising it will get worse. I am also very sceptical that tourists make much of a contribution to the very late night economy that the night tube is designed to serve. They bring some marginal patronage in the centre of town but not elsewhere. The majority of tourists in London will be tucked up in bed long before the night tube starts. If we have a “hard Brexit” with all the downsides that will have in practical as well as reputational / attractiveness terms for the country then I don’t see visitors coming here in large numbers. Why visit somewhere that doesn’t want “foreigners” crossing its borders? And there I fear we must leave it or else hatchets will be being waved. A small technical point: London Councils does not have a licensing sub-committee (it has nothing to license) but it does have an Executive sub-committee. Or did you mean the licensing (sub-)committees of individual London councils? A few further late evening comments. Several typos spotted have been passed to the editing/moderating team to deal. Thanks for eagle eyes. Early days for some of the initial outcomes being analysed – one hopes that such before and after monitoring is in place within TfL. It will be post-Christmas before there’s time to see how things settle down, including more Night Bus adjustments, as there is generally a build up of evening travel demand in the run-in to the festive season. Part 2 will reference the noise concerns as something anticipated and arising, not sure what else could be said at present. It would be interesting to learn more about the remediation works. I think Greg Tingey, Fandroid and PoP have said it all about Thursdays at present. More to be said on early usage volumes in Part 2. Quinlet re “London Councils licensing sub-committee” not existing in reality. That is the specific phraseology in the TfL 16 July 2015 report to the Rail and Underground Panel, in the slide on stakeholder engagement (visible via the link provided above). Perhaps TfL might be able to explain that further. PoP (1): Thanks for compliments, it was a large-scale research task, incl. 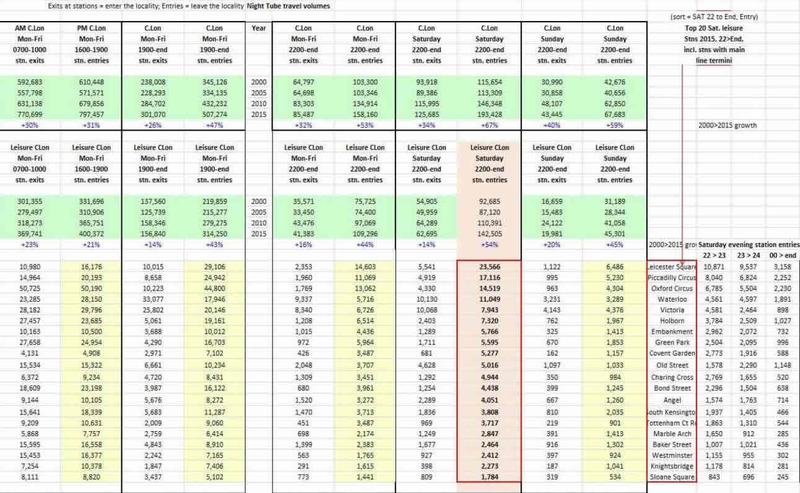 crunching through all the quarter hour station usage numbers for every Underground station, for selected years since 2000. Some more is needing doing for elements of Part 2. PoP (2): About the Bakerloo Line, an earlier draft of the article referenced the trains as a possible reason, as I recalled the event which you mentioned, but I asked TfL for clarification of the reasons for no Bakerloo or Northern Line Bank branch. They were explicit that the two significant factors affecting the Bakerloo were lack of sufficient demand, and no two-way usage as no SE continuation, and with a further secondary consideration being Network Rail infrastructure. I would agree that other lesser risks might be ascribed, but those do appear to be quite sufficient negatives in their own right. Thank you for your spotting – “tour” corrected to “to our” in footnote, and “The precursor in strategic change was” fixed. Thanks for a very informative and thorough article. One question (which I thought was a typo but clearly not) – what is the NR infrastructure at E&C which the Bakerloo operations may infringe on? 2/2…ie the depot is LUL, surely? I think the article was referring to Stonebridge Park depot. Yes, Stonebridge Park depot – the main maintenance sheds – which are on the NR ‘DC’ lines north of Queens Park. As someone who sits on the front of Night Tube trains, I’ve already noticed that after 03:00 there are significant numbers of passengers with luggage, coming into town from the suburbs – presumably these people are heading for early flights, and this is before the Night Tube has even started to serve Heathrow. Although the Gatwick Express and Thameslink do serve Gatwick and Luton all night. Additionally, last arrivals into London at the major London Termini are definitely later than the normal “last tubes”. @Walthamstow Writer – While I fully agree with you that housing costs are a massive problem in London, and that current government policy seems designed to make it worse, there is a bit of flawed logic in your last post. The only reason rents/housing cost go up is if *someone* is willing to pay them. London’s population is still going up, so some people are clearly finding the money, somehow. I fully accept that this may lead to a shift in the kind of people living in London – and those who can afford the housing costs might not be the same people with high demand for late night travel. The latest rumours from a friend who works in lettings is that prices/rents have flatlined in the last 6 months or so. The changes to the laws on buy-to-let had a big impact, and that was before the Brexit vote. There’s two houses near us being marketed for stupid prices, but they aren’t shifting. It will be interesting to see how much those prices drop before someone nibbles. (I am ignoring for the moment the problem of buy-to-not-let foreign investors. This is clearly a problem in certain postcodes but not in most of them). I for one am happy that the night tube currently exists. Waiting now for the Northern Line to come down as far as Clapham, then I can get to the majority of places I want to get home from by tube rather than bus or taxi. I suspect that the new element in the capital-transfer housing market is the number of people who are able to buy a house by selling the one they already live in. Much higher than ever before, even though owner-occupation is shrinking. As a feature of the bubble, much higher than ever before by comparison with wages and salaries and therefore a much higher proportion of prices paid. If only there was someone doing a serious study. I’m sure that there a re plenty of studies being conducted,by Geographers,Sociologists and Economists even as we speak. There is another factor in the mix when squaring the “afordability” circle…one familiar from Victorian times….overcrowding. 3-bedroom terraced houses with ten or more occupants are not uncommon these days…making the rent “per person” affordable. I have it on reasonably good authority that property sales in London form such a significant proportion of GDP that no government will do anything to threaten the bubble…so,until the inevitable happens,the fire will be fuelled. @ Deep Thought – there may well be a flaw in my ramblings. I can just see several factors coming together in a way that either reduces disposable income, reduces discretionary spending or which leads to those more likely to use a night tube moving out of London. There are also plenty of reports about pub and club closures in central London which must, at some point, have an impact of night time travel demand. I know I am being somewhat pessimistic but the night tube is a relatively costly move for TfL and I’ve never been convinced it is *really* necessary. I fully understand why people like the Night Tube and why some businesses are enthusiastic but in financially difficult times for TfL I wonder if it’s the best use of scarce funds. But that argument has value only if costs outweigh extra generated income. Otherwise one would argue the reverse – that in times of scarcity one needs to maximise profitability. Remember the tube has historically made, or been close to making, an operating surplus. It is capital investment that makes it costly and a drain on public funds. If the tube makes an operating profit then intuition suggests that running it for more hours means that it makes more of an operating profit. I know this is not an entirely sound argument and it has flaws but it also has merit. You also have the argument that there must be a tipping point where it is more cost effective to run the tube service all night than run extra buses. It may be the case that we have reached, or are close to reaching, that point. I sort of understand your negativity but if it makes a loss I suspect it will be a small loss but if TfL have read the tea leaves correctly they should be in for a nice regular source of extra revenue – “profit” for want of a better word. If it makes a loss then you don’t expand the service and grin and bear it. If it makes a profit then in the next few years you seize the opportunity and apply it to the DLR, the London Overground, Crossrail, the cable car and anything else that would provide benefits. As someone that has made use of the new night tube services I have to say I have been surprised by the amount of people using it. The Victoria line from Brixton at 3ish was pretty full and the central line had most seats taken. The Jubilee going south to Bond St was noticeably quieter but was busier going north. I’ve seen no trouble and on the whole people are too tired and are only fighting their urge to sleep. Nevertheless this makes a big change from when I was first going out and writing down night bus routes, the long treks in the rain to get to Trafalgar Sq or haggling with minicab drivers over prices home. As long as the service can stay safe and fairly reliable then I think people will flock to use it. Habits take a while to change and as more people become aware of how the service works, along with venues changing the way they operate, the service could become an integral part of London’s transport. @ PoP – Yes the Tube makes an operating surplus. However revenue and patronage so far this year are below TfL’s targets. This is the case for everything bar TfL Rail and Trams. (Source – P6 Financial Report). LU is already deferring or scrapping planned capital spend. After a quarter of a century in the place I know what that means – I had to rewrite investment budgets plenty of times in the 80s and 90s because of wider financial pressures on the organisation. Now TfL may have set itself some stupid targets *or* something else is afoot. At this stage the public can’t know for certain what is going on. As you know I am very sceptical about the ability of TfL to cope with the loss of revenue grant and the Mayor’s Fares (almost) Freeze. While I understand the politics behind this I view both decisions as likely to be disastrous for London’s transport system. You may be proved right about costs vs revenue on the Night Tube but we have had a painful drag to get it into service. That has cost money. The staffing assumptions had to be scrapped and LU was forced to recruit extra staff when the unions wouldn’t play ball. That has cost money along with all the training costs. We also don’t know what else has been “bought off” to stop the JNP Tube Lines dispute that was looming over pensions and other things. Clearly something has happened or been promised because J is running and N and P are imminent. But the shed load of set-up costs is in the past and has to be written off and ignored in any current decision to go ahead with the Night Tube – although it could have been a good argument in the past when the thing was being thought about. To that extent you can ignore them – or at least the current mayor can ignore them. On the day he entered office it was a case for him of “we are where we are”. And, without wishing to be trite, you only have startup costs once. Oh, and I thought trams were doing really badly against target but maybe I am out of date or the targets have changed. This has been partly blamed on Croydon Council repeatedly causing closure of trams through the town centre for pedestrian improvement works. To add to the fun we have recently had delivery of the final two trams on order but no sign, in progress or planned in the foreseeable future, of any way to utilise them to improve the service. Now that is a real capital cost with nothing to show for it unlike the Night Tube. The one thing that the Night Tube is guaranteed to do is to increase revenue and patronage on the Tube (and since the Tube is more expensive than buses this means higher yields even if much of the demand has shifted from Night Buses). qv. Graham H’s point about the biggest single driver of transport demand being transport supply. Whether this revenue fully covers the extra costs is a separate issue but TfL’s overall costs are also below budget. In the long term I wonder whether the creation of a separate pool of trained new part-time staff is in the unions’ interest. @IanJ -one interesting supply side question relates to a study undertaken by Boston (Mass) a number of years ago, in which they put on a “straggler” bus on a number of routes; this prompted useage of the preceding timetabled services to rise. How far this effect could be developed into a fullblown night service on the routes in question is unclear. I know you don’t like hearsay and rumour on here, but there are some comments going round inside TfL that the revenue from Night Tube is less than predicted and hence impacting budget plans. Broadly speaking there are more journeys in line with expectations, but more than expected are on season tickets or hitting the daily caps. That sounds entirely as I’d suspect* given the number of night tube then night bus journeys (especially after passengers have travelled in earlier in the day including starting off with an am peak network rail journey for max. TfL financial pain! then another journey after work to the evening venue, then the final trips home). The current partially open night tube network and scarcity of stations south of the river (currently 9) which leads to greater bus usage may make the pain worse short term. If night tube proves extremely popular with south Londoner then TfL could have real issues as there will alwasy be far more pax with onward bus journeys. It will be interesting to see what night tube does to the surge pricing period that their drivers love, with lots holding off just before the expected witching hour rather than taking a lower fare earlier. Uber fares on far shorter tube journeys from more local tube station will be far less popular with their drivers and the traditional local minicab firms business model will also work well with this. @ Ian J – yes TfL’s costs are below target but not through any miraculous efficiency gains. It’s because they’ve sacked people, cancelled or deferred planned works and jiggled round a number of financing plans leading to a large short term fall in reserves. I assume the works that have been cancelled were considered to be of demonstrable value to passengers and / or business efficiency so somewhere down the line someone is losing out. As I’ve said I’ve seen this all before and I know where it gets you to. It is also evident that Crossrail is now beginning to see some cost pressures in terms of contractor claims and delays to some bits of work – just read the delicate phrasing of the latest Commissioner’s Report and then consider what it really means behind the scenes. Let’s hope we don’t see cost escalation here as it’s likely to be material. I cannot see any easy way for TfL to get itself back to a position of sustained revenue growth which supports the required pace and scale of investment. The current policy framework will also most likely  leave a poisonous legacy come 2020 because fares will *have* to rise then – probably substantially and we know what history broadly tells us about that. A large fall in ridership which then undermines everything you want to do. Even if we have had some structural change in the nature of demand for public transport in London, TfL is not immune to a ridership shock when fares have to go up. I guess there’s a small possibility that the relative fall in fares over 4 years *might* lead to a ridership boom and lots more revenue but I’m sceptical because where’s the capacity to cope with it? It’s not the early 1980s. I am a bit reluctant to labour the theme but one of the troubles with a fares freeze is that the consequences of it are almost entirely bound with what inflation will be and have little to do with efficiency, increased ridership due to more affordable fares or anything else. If the Mayor gets very lucky indeed, despite Brexit and other factors, he will get away with it. More likely the consequences will be the doom you have forecast. It is all a bit like Christian Wolmar’s comment that franchises are taking a punt as to what growth will be during the period of the franchise. At least TOCs are protected from worrying about inflation because that is built into the formula. Conceivably, at times of very low inflation, it is not worthwhile putting up fares. In practice during these rare times, at a very minimum a few peripheral charges are normally put up to keep the revenue in sync with inflation even if the headline fares are frozen. Here’s a fascinating article by Uber about the impact of Night Tube to them. The conclusion I draw from this – people use Night Tube as far as it will go, and then use Uber to travel the last mile or two home. This also demonstrates one advantage Uber has over the average Black Cabs – they’ve got significantly more data to analyse! Fascinating, and particularly about the data reliability of this, it is not just hearsay. Keen to be aware of other examples of solid information on changes in travel habits as these become visible, as Part 2 of this article hopes to identify such interesting (if early) outcomes! Very interesting and I can see this making a lot of sense for another reason. People who aren’t there might find this difficult to believe but traffic congestion can be particularly bad at silly o’clock in the morning. Soho in particular is a bit of a nightmare with people spilling out onto the road and stationary rickshaws getting in the way all the time. So, even if money were not a consideration, it makes sense to walk to the nearest tube (walking is generally quicker than being in a vehicle in many places) and get the tube out as far as possible and only then resort to a mini-cab. The other interesting thing is how we are now regarding Uber as part of the essential transport scene. We can have the usual meaningless argument about whether we call this “public transport” or not. Quite a lot of the underspend seems to be non-deliberate: delays to projects like SSL resignalling meaning money allocated isn’t able to be spent (the money wasted on SSL so far would pay for the fare freeze several times over). @James S: Note that the information is being put out by Uber’s public policy team (ie. their lobbying operation) and definitely aimed at cementing a view of them as, as PoP puts it, ‘part of the transport scene’. It carefully doesn’t reveal the overall impact on Uber’s passenger numbers and revenue (which they must know). Showing percentage changes at individual tube stations without absolute numbers is potentially misleading – the pickups at tube stations outside Zone 1 will be increasing from a much lower base than the pickups inside Zone 1 are decreasing from. I was expecting a bit more from TfL in terms of shifting night bus capacity around. Hackbridge/Beddington is Zone 4 and over a mile from any sort of 24 hour service. Even where I am at the north end of Wallington, all I get is a 24-hour 154 service on Friday and Saturday which is *just* under a mile away (certainly well over that 800m target). I don’t mind a good walk to clear my head late at night but, as noted, Thursdays are a pretty common night out now and I’m right buggered then. … how we are now regarding Uber as part of the essential transport scene. Some (many?) of us do not do so. On the subject of adjustments to Night Bus services, don’t forget that a number of bus services which were not 24hr have now become 24hr at weekends only, specifically in connection with Night Tube. @ PoP – OK I’ve got the message. I’ll shut up about fares and budgets. We will obviously never agree. With regard to Uber and just to carry on my futile line of argument then I think as far as we can go is to say that *some* people consider Uber to be part of public transport. Those who are lucky enough to be able to afford their charges (or those of taxis / p hire operators) can do so. However many simply can’t contemplate paying that sort of charge. That’s where I struggle with their “offer” along with other issues like their obvious desire for market dominance and treatment of their “employees”. @ Chz – I think TfL may end up with some real problems about night tube connectivity. Scheduling supplementary services on 2 nights of the week is not particularly cost efficient but we can see from the data above that in many areas there simply won’t be the demand for a nightly service. I think they will have to adapt and change the initial approach to links but it won’t be easy to get the “right” set of connections. Just turning some day routes 24 hours at weekends won’t work because day routes don’t connect with the tube – especially true for Beddington. If you want maximum coverage then you’d have a wholly separate weekend night route but that goes against many of TfL’s own policies for the bus network. I just don’t see them doing that even if it might be the best outcome for passengers once they got over the hurdle of learning the new routes. Given the approach has long been one of rebalancing resources then expect to see some more changes to the radial night routes to free up money for extra suburban services. James Scantlebury fascinating as this article is, I am always a little bit cautious about percentages where there are no actual numbers given For example, a 300% increase in pickups at Newbury Park may show no more than an increase from 3 to 9, while a 25% decrease in zone 1 might be a drop from 1,000 to 750. But the general trend is, I think, both predictable and welcome. I think it might be case of wait and see what happens when night tube opens on the Northern line soon but agree with WW that TfL are going to run into lots of issues on connectivity in South London. 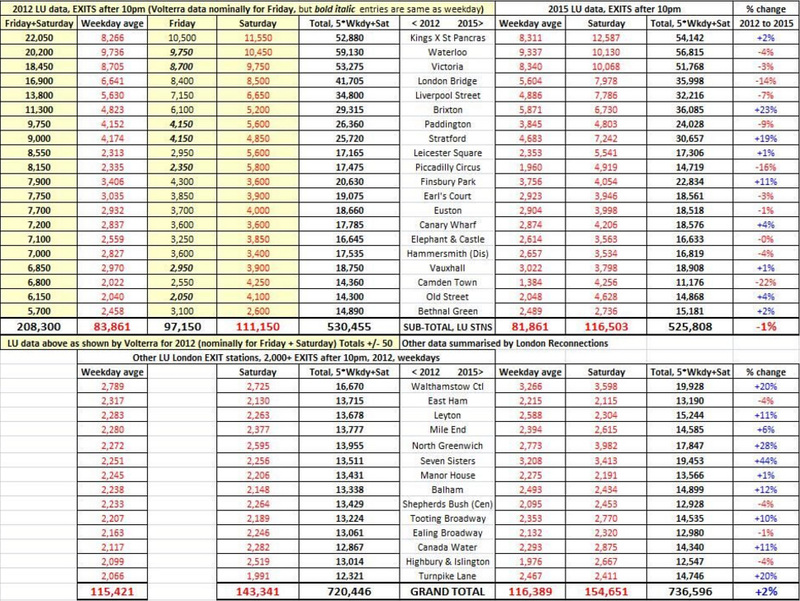 There are some obvious changes but I suspect TfL will want some real data before embarking on less obvious or expensive changes till things have settled down slightly. Given TfL energy use Electricity and Diesel prices will be increasing because of dollar denominated contracts higher up the supply chain, longer term contracts and hedging can only protect you for so long. It will be interesting to see if we get new data when phases 2 and 3 of night tube have been open as I suspect there are some temporary effects in the data as only Central and Victoria were open at that point so some Z1 stations that have seen small growth with just 2 lines open might decrease again with more lines and interchange opportunities open up. The interesting thing will have been if more people are willing to go/stay out late creating a larger market overall and not just a modal transfer. When will the overground night tube (if that’s the correct name) be arriving? The sub-heading title of this article is: “Making the Case”. Though further discussion on this, should perhaps, be postponed until Pt II ? New posters were out yesterday (I didn’t see them Tuesday) – service starts a week today on “the Charing Cross branch”. It seems the roll out has all been going to plan so far. Couldn’t any Bakerloo service terminate at Queens Park, to avoid the Stonebridge issues? There’s no use of NR tracks if so. Plus it’s the busiest station out of Paddington, and I’d imagine where demand would start to drop off. Surely the developments at E&C, plus it being such a bus-hub – render it somewhat useful for S/SE people to get a little further towards home by train. @c: it’ll be interesting to see if the ‘twofer’ deal on bus fares scuppers that for cash customers. If you can bus to the Elephant & switch to a second bus home, it’s 150p vs at least twice that if you Tube to the Elephant & bus from there. Sure, there’s a small time penalty, but look, if you’re out after the normal close of the Tube, you probably (mostly) aren’t time sensitive to any great extent. Anyone with a day ticket/cap or a longer season is in a different place – but those people don’t provide new marginal revenue for your proposed Bakerloo night tube. I won’t comment on the Queens Park end of the line, as that’s not my territory. (@Graham H, PoP: apologies for verbing the nouns ‘Tube’, ‘bus’ & – in this footnote – ‘verb’. Could an alternative way to give Elephant and Castle an all-night service in the short term be to stop the overnight Thameslink services that currently pass through (but which don’t run all night on Saturdays). If the signalling were still compatible, it would be possible to run a night service to Elephant using the connection to the Jubilee at Baker Street. However, I can’t really see a night service as being a priority, all night buses passing through the Elephant already have connections with the Night Tube at Vauxhall (one route), Westminster (five routes), Waterloo (five), Southwark (two) or London Bridge (four). @timbeau – there’s surely the benefit of Elephant itself being on the Night Tube, rather than the bus connections – which would help its nightlife a lot. And I’d imagine the people of Willesden, Wembley and West Hampstead would love not having to get over to Bond Street, Green Park or Westminster, but instead being able to travel from Oxford Circus, Piccadilly Circus and Charing Cross (which have more nightlife around them). The Bakerloo is surely one of the best lines in zone 1 for connecting nightlife locations. All moot of course given signalling, stock and maintenance issues. Quite a lot of discussion about Night Tube at the recent GLA Transport Committee meeting. – London Travelwatch has yet to receive a single compliant about Night Tube but this may be because they only investigate complaints once the complainer has not received a satisfactory resolution from the transport provider. Also, one suspects, users of Night Tube tend not to be the people who email London Travelwatch to complain. – Looking to technical solutions (e.g. rail grinding and cushioning sleepers) where problem noise sites exist. Biggest issue tends to be on the surface where tracks are close to houses. – Concern from at least one committee member than Night Tube may mean a reduced service on some Night Bus routes. Interestingly, in view of earlier comments, committee were quite interested to know whether journeys created revenue or were season ticket holders or people already capped who effectively got the service for free. LU seemed unable to provide an immediate answer but no doubt will do so in future. The 50% increase over predictions also raises the prospect of the Bakerloo line being viable after all. I really can’t see the problem in having access to the depot at night. Night Tube required all sorts of changes and creative solutions to be made. I really can’t see why only not having access to Stonebridge Park depot and only having access to London Road depot stabling sidings should be an insurmountable problem. There are more than enough trains stabled at the latter to run an entire Bakerloo Night Tube service to Queen’s Park. Finally, Mark Wild, LU’s boss, emphasised on many occasions that with the Piccadilly Night Tube not starting until December, and various network effects not known, they won’t even consider any changes to the Night Tube or night buses until May 2017 at the earliest when they have a decent amount of reliable data. @ PoP – thanks for that summary. I haven’t watched the webcast for that cttee meeting yet. A few comments. 1. Wonder if the 50% higher than forecast is an enduring increase in baseload demand or simply a quicker than expected growth which then reaches a level of forecast demand for a few years later. Obviously more money in the bank than expected either way round. 2. I think we need to watch what happens with noise complaints when the Picc starts running. I suspect parts of North and West London near the surface tracks might be rather vocal. 3. Interesting to see that the review of night bus / tube services is now back to May. Completely understandable but it means TfL carrying cost on the night bus network that it might have hoped to save. That won’t be helping the budget process. 12/13 Trains stabled @ London Road / Elephant & Castle. 10 more at Queens Park. Maybe the biggest problem isn’t the depot, though losing a morning train running a dead one back to depot isn’t great, but might be Queens Park – being Network Rail owned (TfL managed), and so close / intertwined with their infrastructure ? It seems to me that the simplest reason for not opening the night tube on the Bakerloo might be the same as for sub-surface lines and Northern via Bank. Lots of Investment work will require closures; so don’t open a service you’ll have to close again before very long. Quite apart from the fact that the existing kit is so old it that 5 nights a week for patch and mend isn’t enough and it still needs all 7. @ Alan G – If your arguments were wholly applicable then TfL really wouldn’t be running a Picc Line night tube. The rolling stock is wearing out and we know the line needs years of upgrade work to get into decent state. The “market” has no doubt won out on the Picc Line and passengers will have to get used to the service not running overnight for many months in the future once the funding for the upgrade has been found (assuming, of course, that it is found!). I agree there is little merit in a Bakerloo night tube when the rolling stock is in such poor state and the daytime fleet requirement has been reduced to allow a faster throughput at Acton to repair the trains. I suspect the “market” (as said above) along with NR related issues re track access and power supply are the real reasons why the Bakerloo isn’t being considered. If I recall the layout at Queens Park, the interface between Bakerloo and NR running lines is west of the carriage sheds, so Bakerloo trains could be “locked in” and run independently of NR. But such a night service on the Bakerloo would not penetrate the suburbs nearly as much as the other lines. Most of the custom it would attract would not be new business but diverted from the Jubilee Line. I suspect the Piccadilly is bit different in that it much easier to close sections of it at a time for upgrade works (assuming it is similar programming to the most recent Northern Line works) than most other lines and by the time the upgrade works start there should be night Subsurface lines running which together with the other night tube lines would largely mitigate any Piccadilly closures between Acton Town and Finsbury Park. The Northern line (High Barnet branch) runs less than 2km to the West to the North of Finsbury Park so plenty of opportunities to get close to final destinations on the Northern instead. As an example in the west you could easily run Piccadilly line shuttles to Heathrow from Acton Town, Hammersmith, Hyde Park Corner, Kings Cross, Wood Green or Arnos Grove depending on what the most westerly point of the line closure was at the time. As regards Bakerloo I suspect we should wait till the other night tube lines have opened to assess whether the Bakerloo makes sense. I suspect some of the initial night tube line passenger numbers will be cannibalised by the next phase of openings so with the next phases opening the numbers may not remain 50% above expected levels* hence WW’s caution about the shape of the growth curve. I suspect TfL delaying its bus re-planning till it has more evidence is quite wise as the data on route substitution with phased opening will be interesting. Jan and Feb being the low months for the hospitality industries should also help define the minimum in seasonal use with the currently planed night tube network full open. *though it would have been wise to be as conservative as possible for those involved e.g. numbers just high enough to make the BCR ok after X years with the rest turning out to be surprise bonus. Queens Park is very hemmed in by Network Rail infrastructure. The tracks through platforms 1 and 4 – the outer ones – are theirs. As is everything, give or take a few metres, beyond the North wall of the North Sheds. On the plus side, a quick glimpse of the traction diagrams reveals that that side of things is pretty well contained. LINK to the Carto Metro diagram @ Queens Park, for the avoidance of doubt …. As I understand it, Bakerloo trains terminating at Queens Park reverse in 22 or 23 roads of the “north” carriage shed (which is actually south west of the station, but hey-ho). I would expect that this can be done without interfering with NR – both roads are dead ends so an over-run would not end up on NR tracks. (Through Bakerloo trains to/from Willesden and Harrow use 21 and 24 roads through the sheds, which connect to the NR tracks at the west end of the sheds. 21 road has trap points so again an overrun would not stray onto NR tracks, but any train using cannot reach the southbound Bakerloo platform and would have to leave Queens Park “wrong road” on its return down the hole (although not impossible, as there is a crossover just before the tunnel mouth). 24 road cannot be reached from the northbound platform at Queens Park. @ Ngh – You’ve got a more optimistic view of the Picc Line’s capability to work in sections than I have. Clearly there will be a low level of service for a night tube so less strain on reversing points / crossovers etc. My past experience as a long term user of the line was that any planned / unplanned use of the turning points nearly always led to problems with whatever service was supposed to be running. Hopefully LU has fixed those weaknesses but the sectional working capability east of Hammersmith isn’t marvellous. For other lines to “take the strain” TfL may need to consider some additional weekend night buses to provide the cross links you suggest. Only the N41, 102 plus weekend night 34 and upcoming 307 would provide any linkage between the corridors and those are only half hourly at weekends (except N41). The N91 maintains the key radial link from Central London. Obviously not impossible to do the work in sections but it will be interesting to see what people do when faced with closures of night tube services. There seems to be underestimation here of the necessity of depot access for Night Tube lines. Every Tube train has to be given a once over by the fitters every 24 hours. Night Tube operations aren’t just running trains up and down the lines – every train that is in service when the evening’s Night Tube service begins gets taken out of service before daytime services recommence, with fresh trains being brought into service during the night to replace them. Thank you – that is certainly a point I had not realised. And unless Elephant and Queens Park can do that “once over” for sufficient numbers of trains, that seems to put the kibosh on any Night Tube service on the Bakerloo unless and until a full depot actually on the LUL section of the line is built as part of the proposed extension to Lewisham and beyond. If TfL could make a deal with Network Rail with regards to NR infastructure carrying TfL services, they might be allowed to run night services on at least some parts of NR. If such a deal was made then not only could it provide the Bakerloo with nighttime access to it’s main depot, but it would also facilitate Night Overground services as well as allowing for a potential Night District line to Richmond (Gunnersbury-Richmond is NR owned) if that was deemed worthwhile (of course, that would have to wait for the SSR upgrade to be finished first). Looking ahead, it could also allow a Night Crossrail service to be something more than just Paddington-Abbey Wood. The physical capability is there (unlike many of the other lines) whether you would want to use it is another matter! I suspect you would want to replace the points and point motors beforehand. Agreed that Hammersmith makes the most sense overall especially from the comms point of view as passengers get used to the same large central area being closed for night tube. Anon E. Mouse at 16 November 2016 at 10:17	(If TfL could make a deal with Network Rail with regards to NR infastructure carrying TfL services, they might be allowed to run night services on at least some parts of NR). Another good example would be if the Overground East London Line were 24 hours. If TFL could use NR infrastructure, the trains could serve Canonbury and Highbury & Islington (thus linking to the 24 hr. Victoria Line), rather than terminating at Dalston Junction. @ Anon E mouse – and if TfL can reach agreement with whoever the SWT franchisee is to cover the cost of opening Richmond Station. I dread to think what the cost would be now. Life might get easier if the inner area services are devolved to TfL at some point. While I understand the desire to see night trains on NR tracks I can’t see NR being willing to relinquish any of its engineering hours access. Even years on, there has been no relaxation to the lateish start of NLL services on Sunday mornings because NR have the block on track access for track checks etc. Given that inspections and maintenance *have* to be done we would need a shift in technology, productivity and the nature of assets deployed to see material change to the length of time needed. It’s possible, of course, but there’s a price tag attached. If there are night time freight workings then the FOCs are guaranteed to object to any access request – seems to be standard practice. We know FOCs are very reluctant to release any historic paths in the working timetable regardless of whether they are currently used. Exactly. They might also be able to run services down to Croydon so as to provide better coverage south of the river. A Night Overground service via Camden Rd could also be useful. The Bakerloo question seems an odd one. I know this doesn’t refer to the slow lines that the Bakerloo uses beyobd Queens Park, but back in the 90’s, NSE used to run a night service between Euston and Northampton (I understand from friends who live along the line that this is no longer the case), so presumeably a night service on the slow lines might be possible? @ Stationless – doubtful about a night service. I read recently that the WCML fast lines are closed in the late evening for maintenance and inspection so everything else has to run on the slows including late evening Virgin services. Assuming there is overnight freight I wonder how much residual capacity there would be for a night service on the WCML. I understand the last LM trains out of Euston are extremely busy though. A quick look at Real Time Trains confirms slow line use between Euston and Milton Keynes and also a decent amount of freight passing through Watford Junc (as a sample timing point). Last LM train to Milton Keynes leaves Euston at 0134 which isn’t bad really with the last VT to Wolverhampton at 2330. I can think of other main lines without such late departures. I read recently that the WCML fast lines are closed in the late evening for maintenance and inspection so everything else has to run on the slows including late evening Virgin services. The sleepers certainly always use the slow lines in my experience. here’s footage of an HST using the dc lines when the ac lines were under maintenance. Given the stretch from New Cross Gate to Croydon is 4 track paired by direction then virtually no chance of night overground, TfL thinking has apparently been north of New Cross Gate only on their section which also has lots of low maintenance slab track. It refers to the DC lines not the Slows which don’t have 3rd/4th rail. In the second half of the 70s there were certainly through-the-night services on the DC line between Euston and Watford. Nominally staff trains but regulars (like myself) were permitted to use them too. The first official view on the Night Tube implementation to date has emerged in a report going to the Customer Services and Ops Performance Panel next week. No huge shocks in there. Demand confirmed as being ahead of forecast. Not too many woes to deal with but it looks like noise and vibration has been the biggest area with a lot of work done and more to come to reduce track noise. Multiple further reviews due over the next few months as more stable data trends start to emerge to give a more reliable basis for decision making. This includes a review of Night Bus services (as expected). I’ve not used the Night Tube so have no personal insight as to how well or badly it performs. Wow – published here before it was even written !